One of the key recommendations to come out of the Dame Judith Hackitt’s Independent Review of Building Regulations and Fire Safety was for a clearer, more transparent and more effective specification process to put an end to cost-cutting compromises. As heating manufacturers, this is something that resonates, as we engineer to maximise lifetime operational efficiency not just in high rise dwellings but in all non-domestic buildings. Heating systems have a crucial role to play in optimising building comfort levels and enhancing the wellbeing – and therefore the productivity – of its occupants. The performance also correlates directly to the building’s operational costs and environmental impact. So why, when the days of a ‘one-size-fits-all’ approach are long gone, do engineers still see their original design changed, or specified components swapped out? One common answer is value engineering (VE). Applied optimally, VE can be a collaborative exercise that enhances performance at the lowest cost. But the unfortunate reality is that VE is typically used as a cost-cutting tool that removes rather than adds any project value. To understand the implications of cost-cutting on building performance, let’s consider heating. To meet more stringent efficiency requirements, system designs have become more complex, tailored to the individual requirements of a building to reduce energy waste. As the specified equipment will often help define the heating solution, breaking the design could compromise performance. For an accurate assessment of a product’s cost throughout its lifecycle, it’s essential to consider all the processes involved, from installation to maintenance and servicing. The design of the boiler is often key due to the reduced available space within plantrooms and/or access restrictions to their basement or top floor location. Boilers with a high temperature secondary return feature optimise operation with variable temperature systems and low carbon technologies. Even features such as size and manoeuvrability should be considered before cost cutting. Manoeuvrability has also been addressed on some of the higher output boilers with the inclusion of integral wheels or by enabling the larger boiler units to be easily dismantled where access is awkward. This helps contractors protect the budget by reducing labour and time costs. 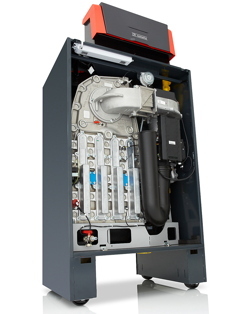 Multiple-boiler designs are increasingly popular as this arrangement maximises heating reliability, efficiency and ease of servicing, while extending the boiler’s lifecycle for greater long-term savings. So, in such a scenario, it’s worth identifying if the boiler has been specified for modular configurations as this will offer the greatest efficiency advantages. Legislation like the Energy related Products Directive (ErP) and the London Plan have effectively encouraged a drive away from non-condensing towards higher efficiency condensing boilers to meet tighter efficiency and emission level requirements. As a result, the opportunity to tailor a previous working solution to the new task may no longer be viable. As retrofitting condensing boilers onto a dated system will typically require new flue arrangements, some condensing boilers have been designed with multiple flueing capabilities. This provides greater plantroom flexibility for the designer, while making them more straightforward for the contractor to install. Swapping out the specified component could therefore unnecessarily complicate the installation and result in extra costs. The modern low carbon plantroom will often require the introduction of low carbon or renewable heating technology in a hybrid system. A designer may have specified a boiler model with a high temperature secondary return feature as this optimises operation with variable temperature systems and with low carbon technologies. Changing the equipment specification could therefore have a negative effect on the end result, as the design is unlikely to achieve the predicted outcome. Good control will ensure that high efficiencies are maintained, and emissions are kept low throughout the product’s lifecycle. For this reason, certain boiler models will be supplied with temperature and time controls as standard and intuitive controls that encourage the maintenance manager to take greater control over energy usage. 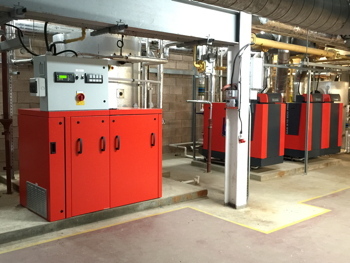 Some boilers can be connected to the building management system at no extra cost, while compatibility with optional zoning controls will further maximise comfort and efficiency. But swap for a boiler without these superior control features and the building will fail to perform as anticipated. Factoring in servicing and maintenance provides a more accurate understanding of lifetime costs. Some boilers offer more straightforward interrogation than others; parts will be more easily accessible; and, if manufacturer spare parts are available, it’s simpler to keep the heating operating as intended. Good manufacturers will provide customer service like an out-of-hours technical assistance helpline, helping ensure continuous heat provision. This is particularly important in buildings like hospitals and care homes. An added feature contributing to easier maintenance is the inclusion of a PC connection for servicing and a data file for storing fault/run information. As an industry, our aim is to deliver comfortable, energy efficient buildings. We have the technology and the expertise to support this. What we need is to put an end to any process – costcutting or VE – that compromises high-quality engineering and specification and results in poorly performing buildings. With a deeper understanding of the heating equipment and how it sits in the overall design, building services engineers will have a better chance of defending their specifications further down the line. And if that delivers the required energy performance from a building, then everyone’s a winner.